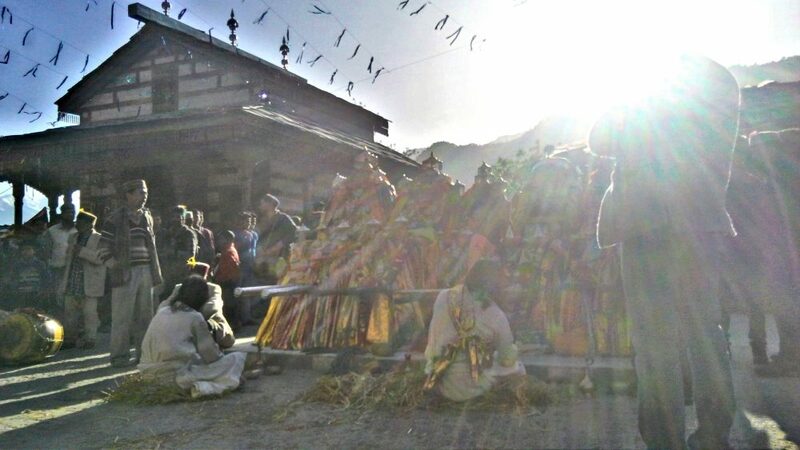 SAIRU SAJJA: Celebrating harvest in Jagatsukh village. In the land of Gods, the passing seasons play a significant role in their deep-rooted traditions. 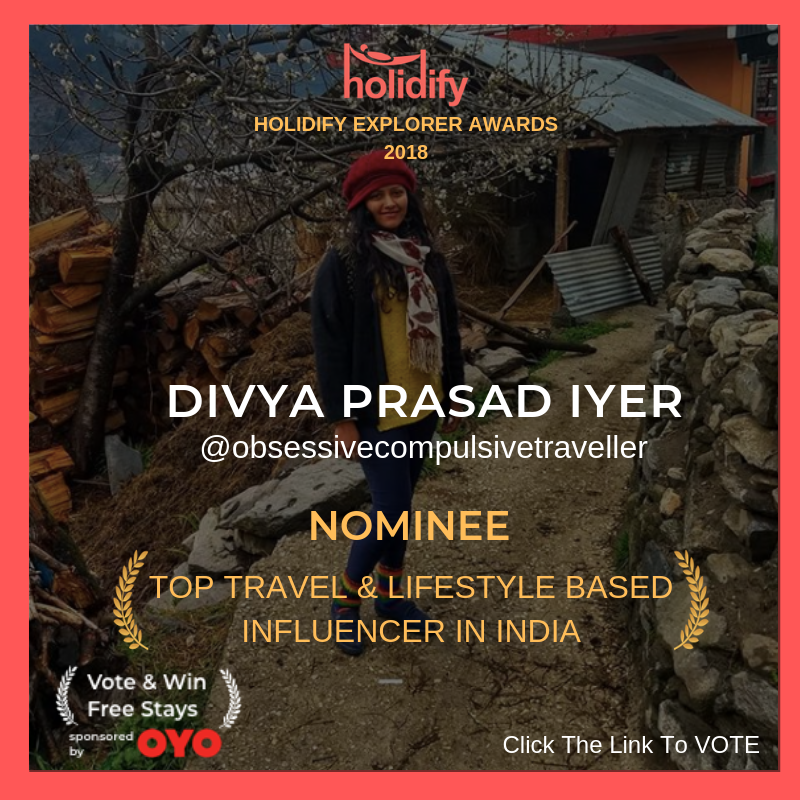 Living in a little home perched atop Jagatsukh village for half a year now, I had a chance to explore the lives of the Himachali community closely. I learned that their traditions are deeply rooted in nature. Worshipping the five elements and deities in varied forms has been their way of life. Each village has a resident deity who is assigned a specific role in the lives of the community. Whether it’s asking for good rains or snowfall or neither, they look up to the designated deities for significant decisions and guidance for the community as a whole. The deities are as alive as the people; engaging with them through a ‘Gur‘ – a shaman. The ‘Gur‘ takes on the purpose of channeling the Devtas and communicating their messages to the community. Just like us, the deities as living entities meet and greet other deities on special occasions. 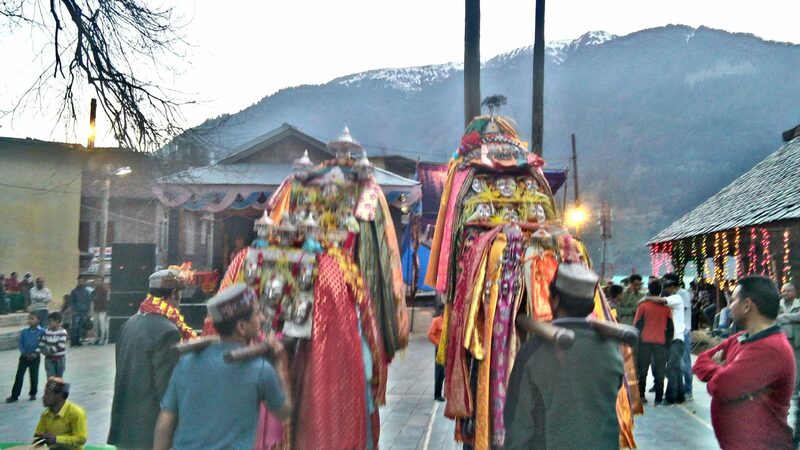 For deities, these occasions are a way to personally engage with other deities in the valley and the community. Together, they dance and feast away, in a spirit of joy. 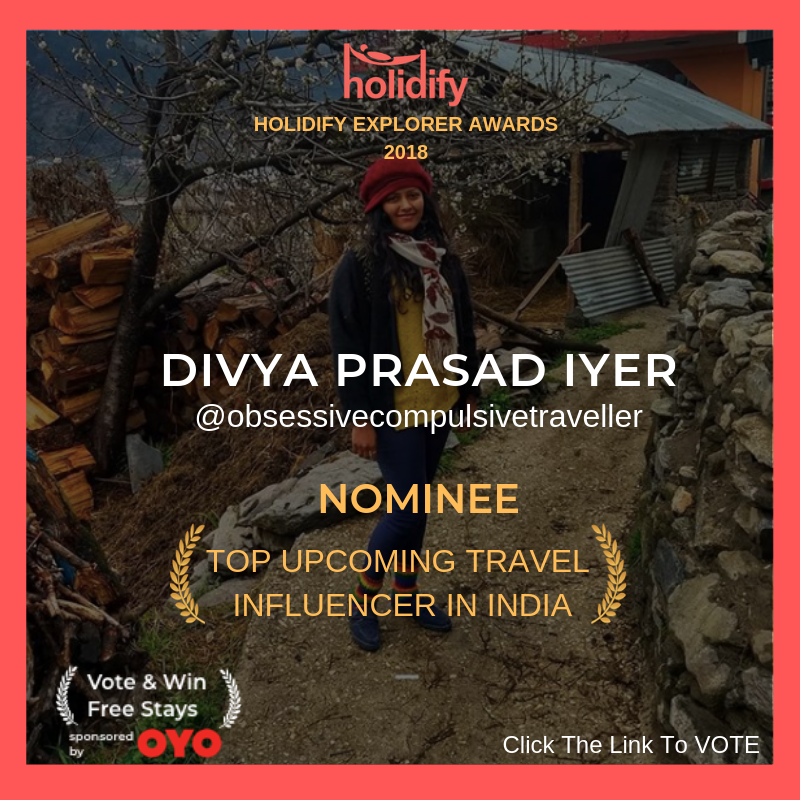 This itself is a reflection of a Pahadi’s deep connection with nature and its deities. A Gur channeling the ‘Thaan’ Devta – the fire god. As spring sets in the month of Phalguni from mid-February to mid-March , celebrations begin in full swing across villages to thank the designated deities of every village for the beginning of the fertile season. The spring marks the sowing of seeds. 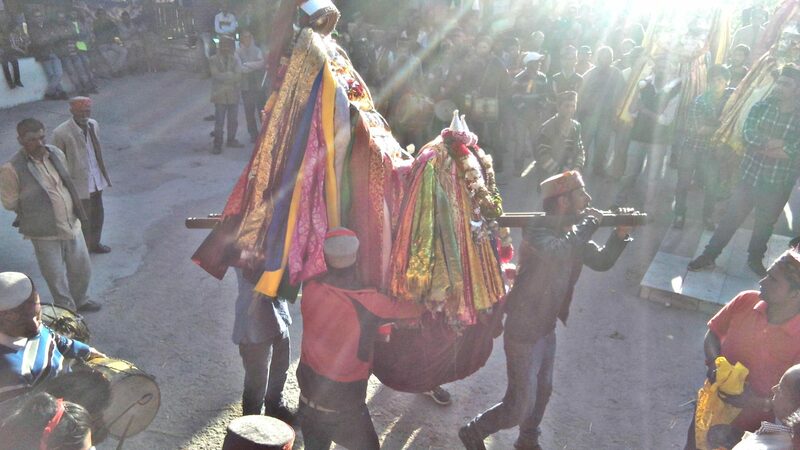 The beautifully adorned palanquins – ‘paalkhis‘ of Devtas begin their journey to several villages to greet and honour each other. They dance away to celebrate the spring after the evil months of winters. The sun and rain gods grace the earth with fertility. The valleys begin to deck themselves in greens and vivid flowers. This gathering of the people across villages is known as the ‘Mela‘. Each village along with their respective deities host the Mela and feast away in the months of summers till the rains take charge. In the months of August and September. The locals get busy plucking the apples and walnuts to welcome the Sairu. Shamanic rituals with the Devtas at Mata Docha Mocha Temple,, Gajan. 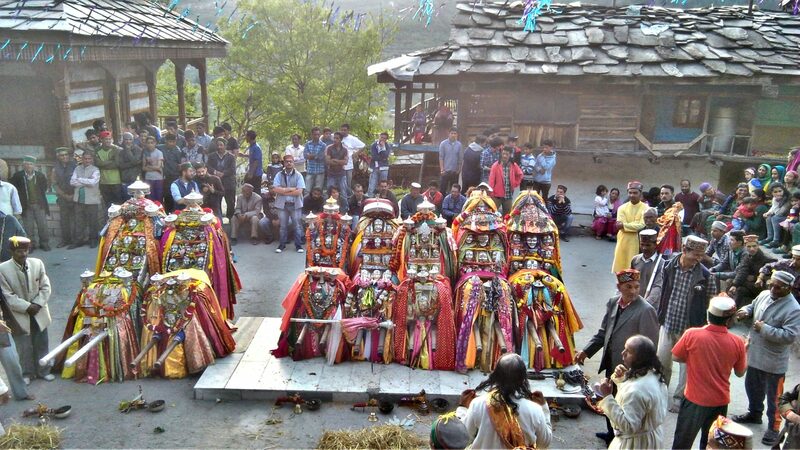 The beautiful Mohras of Devtas. Gradually as the rain gods curb their showers in the month of Bhadra, it’s the time to reap the goodness of the harvest. As per their local almanac, the festival of Sairu Sajja falls on the day after the end of Bhadra month and the beginning of Ashwini month. It’s the day of when the fresh harvest from all the homes is offered to the deities. It’s a tradition to first offer the season’s harvest to their deities and receive their blessings. On the last night of the Bhadra, a special altar is set up for the deities. The local home-grown produce such as apples, apricots, rice, black gram, cucumbers, cereals, and grains are arranged in a brass bowl with an adorned corn stalk to honor the Devtas. On the day of Sairu, the young and old ones wake up early in the morning and head straight to a water body. Cupping water in their hands, they pray to the deities and let it go. The sacred herb of Bethar (Juniper) is smudged, followed by a set of rituals to honour the symbolic deity at the altar. After the rituals, the Devta’s edifice is immersed into a river. The offering of the season’s harvest symbolizes sharing of co-existing resources of nature. It represents paying homage to the creator for the harvest and abundance in their lives. Devotees swaying to Maa Dotcha Mocha’s rhythmic moves. A special feast is prepared as an offering to the Devtas. 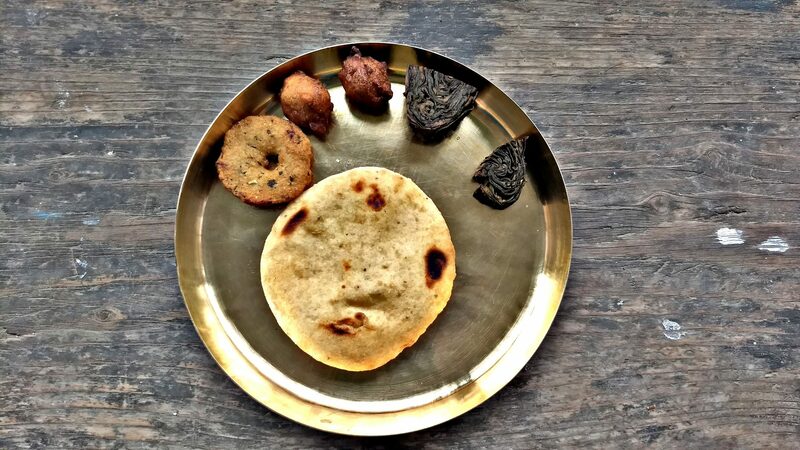 Traditional delicacies such as ‘Bhaturo‘ – a fried yeast bread, ‘Mash ke Bhalle‘ – fried black gram patty, Childa – a pan-fried rice bread, Patrodu – fried Colocasia leaves pinwheel, Gulgule – a fried sweet balls and Kheer are served. The Sairu Sajja special Pahaadi platter. The loved ones visit each other to gift each other stems of the Sartaj plant, popularly known as Genda in other parts of India. Locally, it is called the Jhoonu. Every village has their own customs and some even gift the ‘Dhurva‘ grass. The type of stem offered varies depending on its availability in their village. In Jagatsukh and its neighbouring villages, the Sartaj plant is abundant hence it is considered to be auspicious for all religious events. Living in this village for half a year now, I was invited by my neighbours to be a part of these celebrations. I am deeply humbled to receive a lot of ‘jhoonus‘ and local treats as blessings. I hope to live longer to tell these tales. The young and the old ones exchange ‘jhoonus‘ with each other as blessings for fertility and longevity. There’s a story to why this custom became a part of their traditions. In the olden days, the number of deaths during summers were significantly higher due to a host of diseases and epidemics in the mountains. 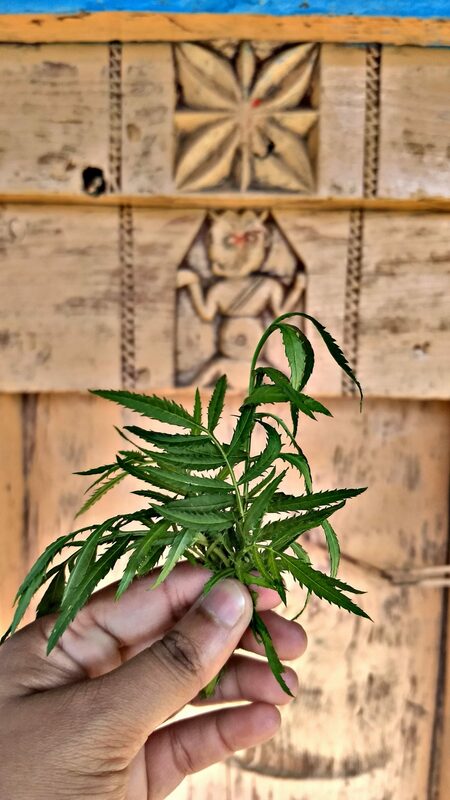 So the ones who survived the summers were honoured and celebrated by gathering to exchange ‘jhoonus‘ as it was the only sacred plant available in the mountains’. This was also a sign that they are still alive as the winter sets in. They believe that serious illnesses are never caught once the winter sets in. Also, this was an occasion to reconnect with family and friends scattered far away in the mountains. Thus, the valley prepares for the onset of the winter festivities. 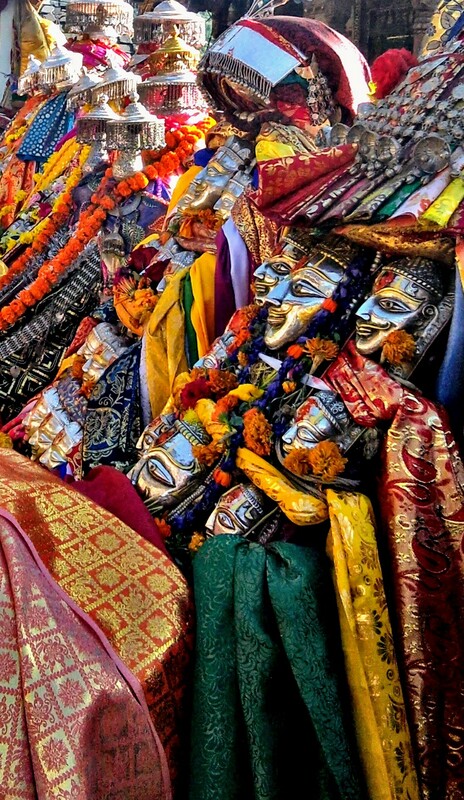 It’s a time when the gods and goddesses arrive at the heavenly land of Himachal. The days of summer surrender to the chill. The Sun gods will sleep early; while moon gods reign the skies. The mountains will be cloaked in snow. The fireplaces come alive in every home. Its people are enwrapped in the warmth of wool. Steaming cups of ‘Chais‘ will become a ritual. And the Himachalis will embrace their transition into the mighty winters. 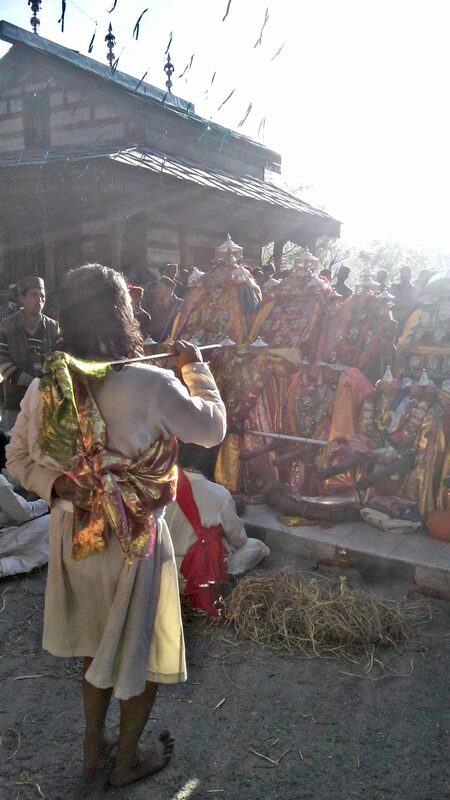 Sairu Sajja in all essence is a celebration of home-coming of gods into their heavenly abode. “Sairu Sajja mubarakan Himachal vaasiyon“. Previous Previous post: THE WEAVING HEARTS OF PANBARI, ASSAM. Next Next post: Quan Yin Teng: Divine tales of yore at George Town’s street of harmony. Thank you so much for this beautiful article and pictures. I was there in April and saw a festival quiet similar like Mela, but here is it about September ? do you know what is the diffference ? Thanks. My husband and i got delighted Michael managed to do his studies from the ideas he discovered out of the web pages. It is now and again perplexing just to be giving freely things that some people have been trying to sell. And we all see we have got the website owner to thank because of that. These illustrations you’ve made, the straightforward website menu, the relationships you will make it possible to instill – it’s got most unbelievable, and it’s really making our son in addition to us imagine that this subject matter is brilliant, which is especially important. Thanks for all the pieces! I precisely desired to say thanks once more. I do not know the things I would have worked on in the absence of those tips and hints documented by you regarding that question. This has been a very fearsome situation in my view, nevertheless coming across the very specialised technique you processed that took me to weep with joy. I will be thankful for this service as well as pray you realize what a great job you are putting in training many people via your webpage. Most probably you haven’t met all of us. A lot of thanks for your own labor on this web page. Gloria loves doing research and it is obvious why. We all know all of the powerful means you offer vital tips via the website and as well as recommend response from website visitors about this theme plus our own daughter is without a doubt being taught so much. Have fun with the remaining portion of the year. Your doing a pretty cool job. I wanted to draft you this little observation just to give thanks again with your lovely things you’ve contributed at this time. It’s so incredibly open-handed of people like you to give easily what exactly most people might have offered as an electronic book to help with making some money for themselves, certainly since you could have tried it in case you wanted. These inspiring ideas in addition worked to become a great way to comprehend other people have similar passion the same as my own to grasp more when it comes to this issue. I am certain there are numerous more pleasant opportunities in the future for many who discover your blog post. I’m just writing to let you understand what a remarkable encounter my cousin’s child experienced reading your blog. She came to understand many issues, which include what it is like to have an incredible helping spirit to make most people smoothly gain knowledge of several specialized topics. You undoubtedly surpassed readers’ desires. Thanks for imparting such powerful, trustworthy, edifying and in addition easy tips about this topic to Julie. I must voice my love for your generosity supporting people who require help on in this field. Your special dedication to passing the message all over turned out to be rather useful and has all the time encouraged many people just like me to get to their ambitions. This useful hints and tips signifies a lot a person like me and substantially more to my colleagues. Warm regards; from everyone of us. Thank you for your entire labor on this website. My daughter takes pleasure in doing investigation and it’s really easy to understand why. We all hear all about the lively manner you give advantageous solutions via this web blog and as well as foster participation from other ones on that concept while our girl has been discovering so much. Have fun with the remaining portion of the year. You’re doing a fabulous job.